This week started off the month of August, which surprisingly started off cooler than most of July had been. In the hopes that me sweating less would ease my acne a little, I spent this week trying to heal my acne and post-acne redness and scarring that I'm experiencing. This mask was a very interesting experience. This two-piece hydrogel fit well, smelled kind of like patchouli, and made my face tingle like I had rubbed it with menthol - I think it must be a mix of the ginseng and all the essential oils in this mask, but the scent is very unique and after a while it is very calming. There was extra essence with the mask, but it was a thick since there is no water in this mask, so it felt a little difficult to work with. 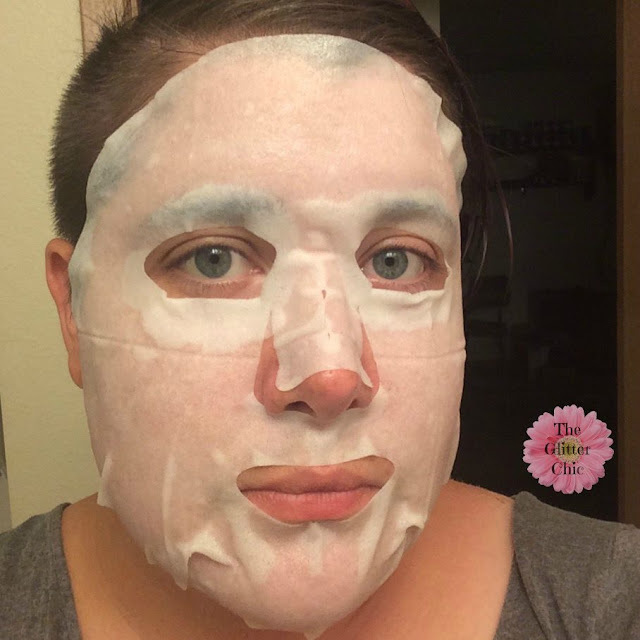 The mask slid around my face a lot for the first 10 minutes or so, until it started to dry out, then it sat nicely on my face. The following morning? 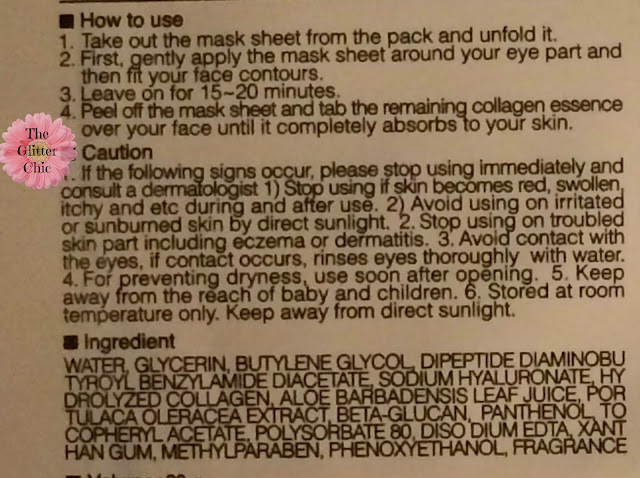 My skin was definitely softer the next morning, but there were no real visible effects to speak of from this mask. But it also didn't break me out, so I'm pleased. I love the packaging of this mask! 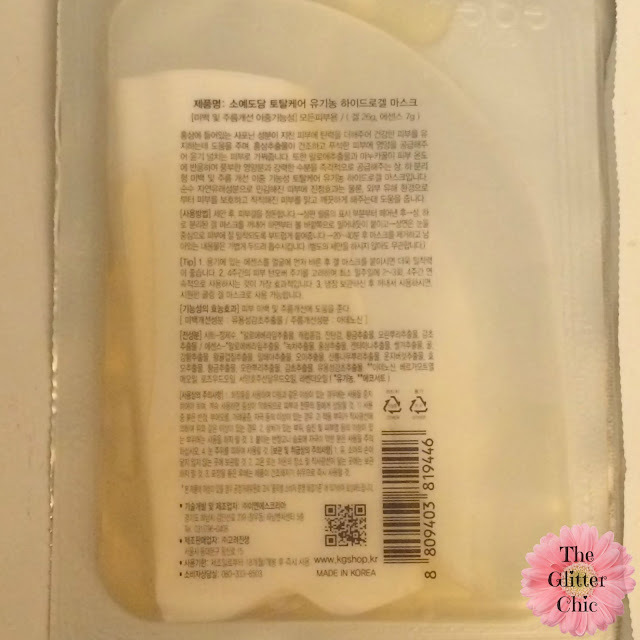 It's so cute ^_^ When I opened this mask I noticed a floral scent. I'm normally not a fan of floral scents in my skincare, but as long as I don't start to taste it I'm willing to try it on a single-use mask. 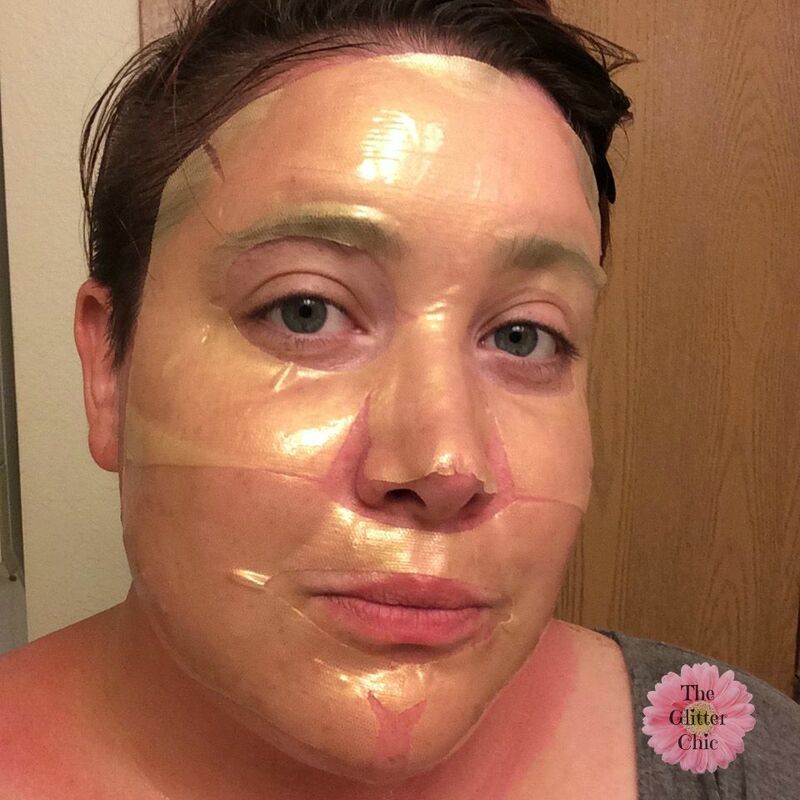 The mask is gold in color and has a mesh inlay to strengthen the hydrogel and give something for it to adhere to. 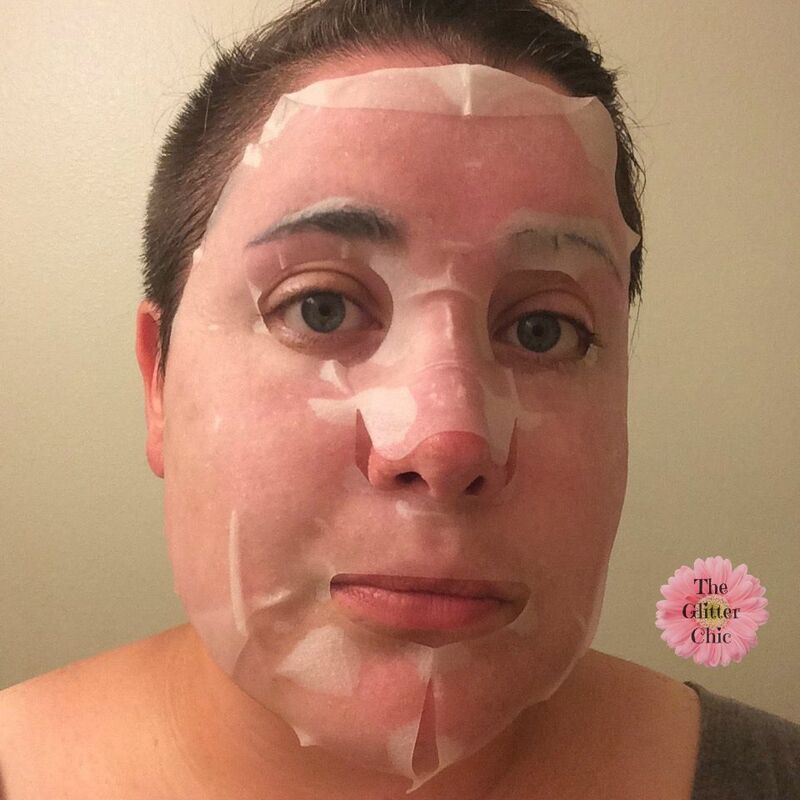 There was a plastic sheet on both sides of both pieces of this mask - I removed one side and applied the gel to my face, I then removed the other piece of plastic and straightened out the mask piece. 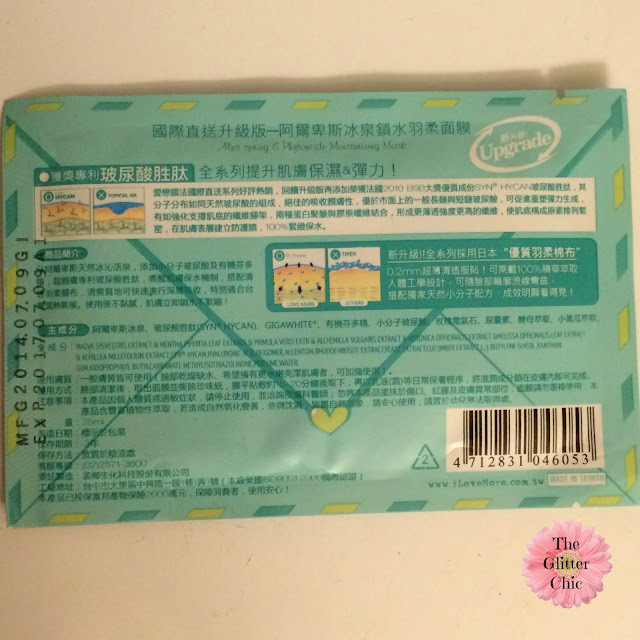 This mask was very thin and a little difficult to apply, but once it was on, it stayed in place well and felt very cooling and calming on my face. The instructions indicate to leave the mask on for 20-40 minutes, so I left mine on for the full 40, and most of the essence had absorbed into my face by that point. The mask pieces were much thiner and felt mostly dry. My skin felt soft and hydrated, and looked a bit brighter. 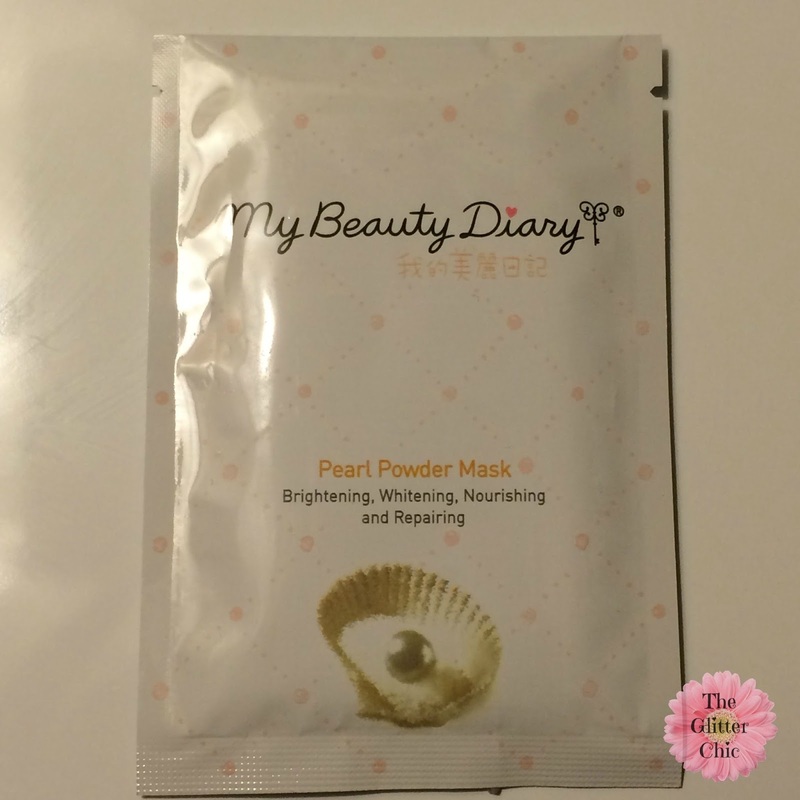 We had spent the day at the fair with my parents this day, so this was a perfect mask to nourish my sun-dried skin. The following morning? I woke up with hydrated and brightened skin. 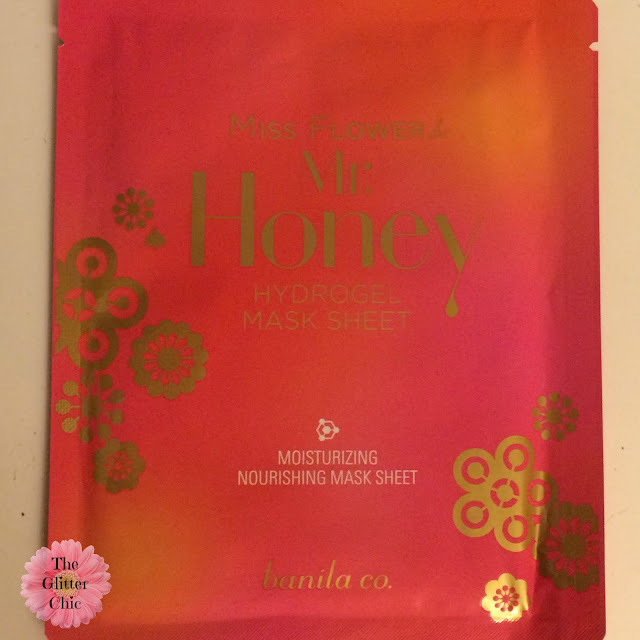 While the effects didn't seem long-lasting with just one mask, I'm impressed with the clarity this mask gave my skin and how hydrated it stayed overnight with just a light moisturizer after using this mask. 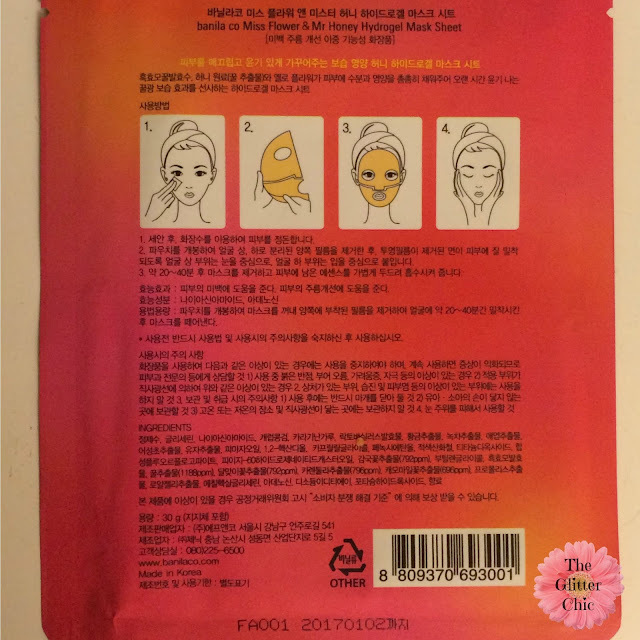 This mask had a very faint scent when I opened the package, but it had disappeared by the time I got it situated on my face. The material was thicker than I like, it was a little difficult to fit to my face nicely - the eye holes were a bit small and uncomfortable with the thickness of the mask, but otherwise once I got it fit around my eyes the rest of the mask formed ok underneath my mask cover. This mask had the perfect amount of essence, it was perfectly saturated with very little left in the package. Unfortunately, after about 15 minutes my face became very itchy, so I ended up removing the mask. My face did not look red or irritated after removal, but it did take a few minutes for the itching feeling to stop. This mask gave a minimal moisturizing effect, and not much besides that. This day was a long day, and I just wanted something that sounded like it would moisturize my skin - this looked perfect! 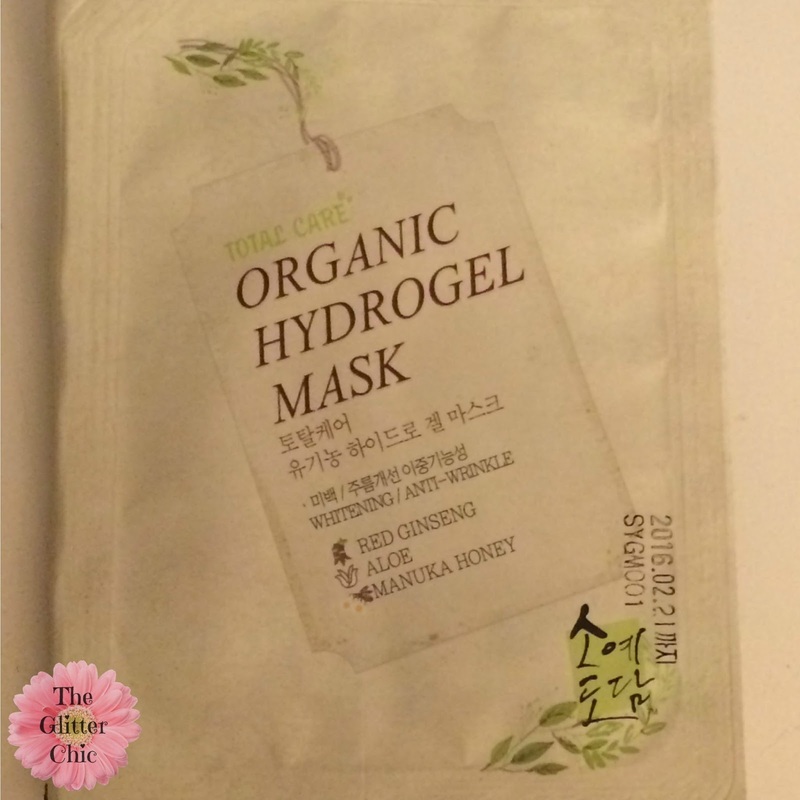 This mask was thin, formed to my face nicely, and was soaked with the perfect amount of essence. It didn't stay down around my nose too well, so I used my mask cover with this. 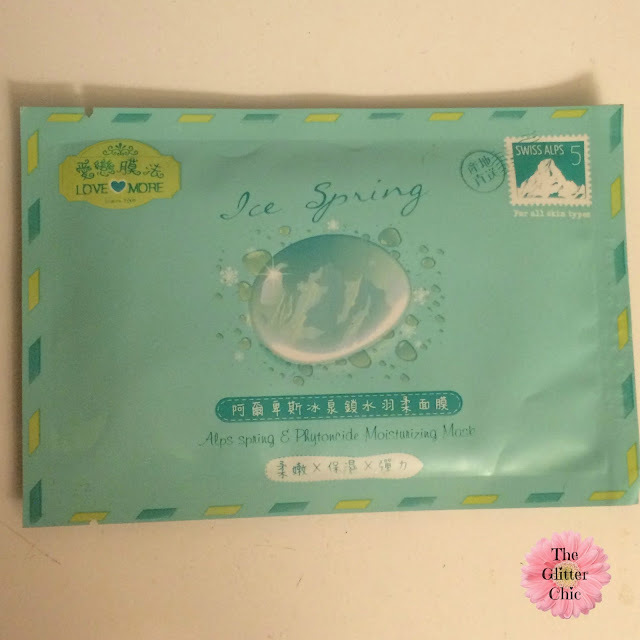 It was cooling and relaxing, with little noticeable scent. This mask gave my skin a nice plumping effect, and my skin still felt soft and hydrated in the morning. It had been so long since I'd used a My Beauty Diary mask, but they used to be my favorites until I branched out and was able to explore more brands. This mask has a funny fit. I know they recently revised their packaging, but I wonder if the masks changed a bit? Or maybe they are slightly different depending on what type they are, but I don't remember them fitting like this on my face. Once I got it situated the best I could, I really struggled with the amount of essence in this mask. 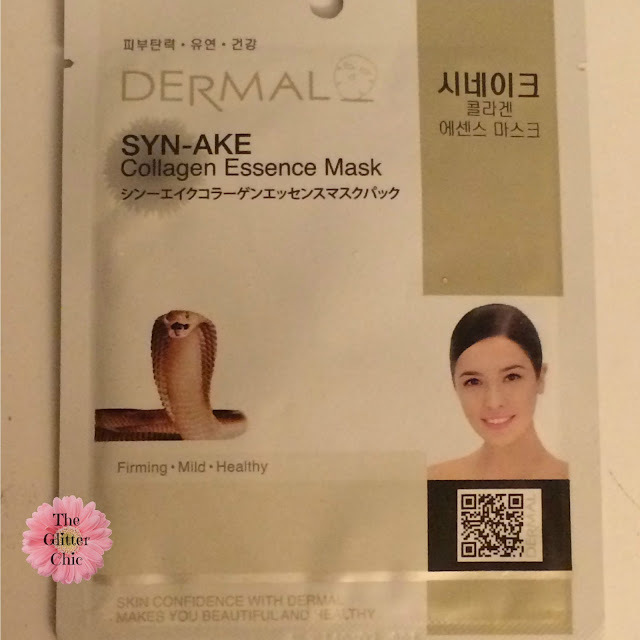 There was a lot of liquid left in the package which I applied to my arms, but I was able to spread extra essence on my neck and décolleté throughout the entire duration of me wearing the mask of my face as well - it just kept running down! 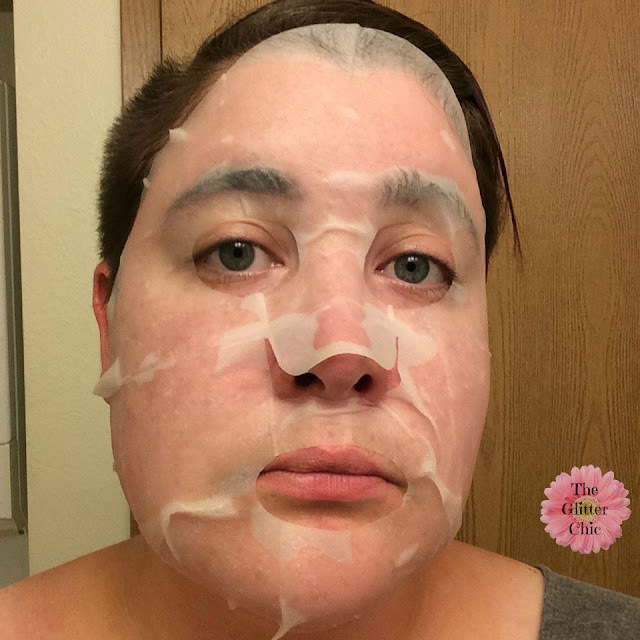 My skin felt very hydrated when I removed the mask, and though it took a while for the essence to fully absorb, it did not leave my face feeling sticky. 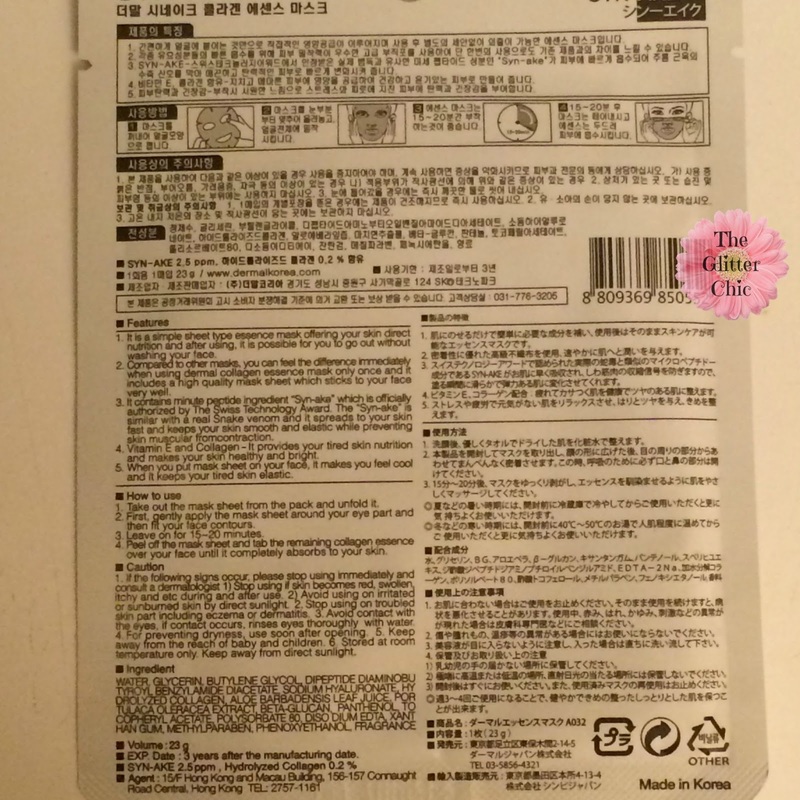 The following morning my face was brighter and my dark spots seemed lighter. 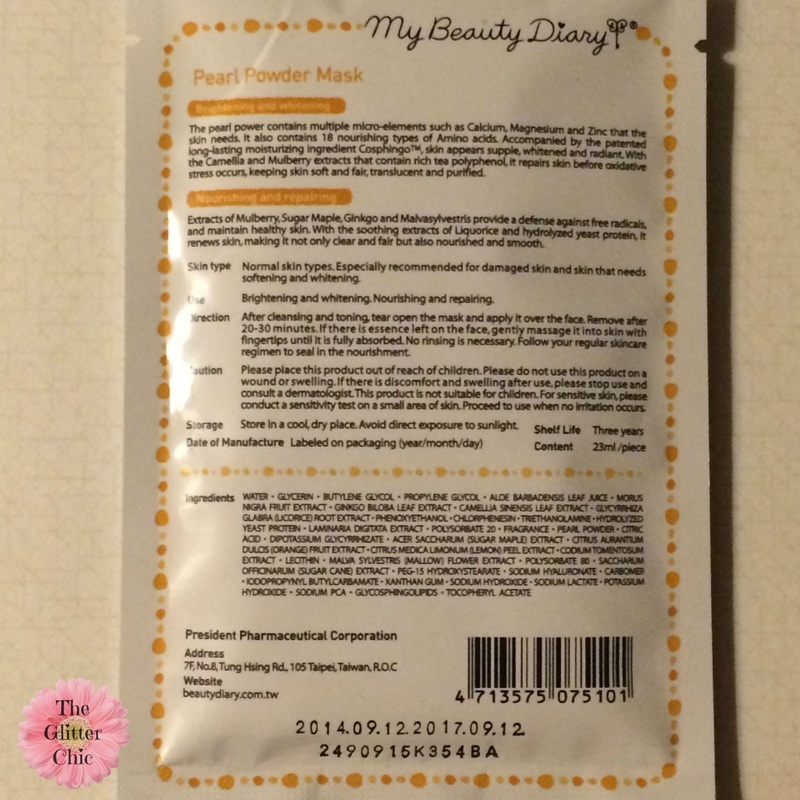 I was very impressed with the results I received from this mask. 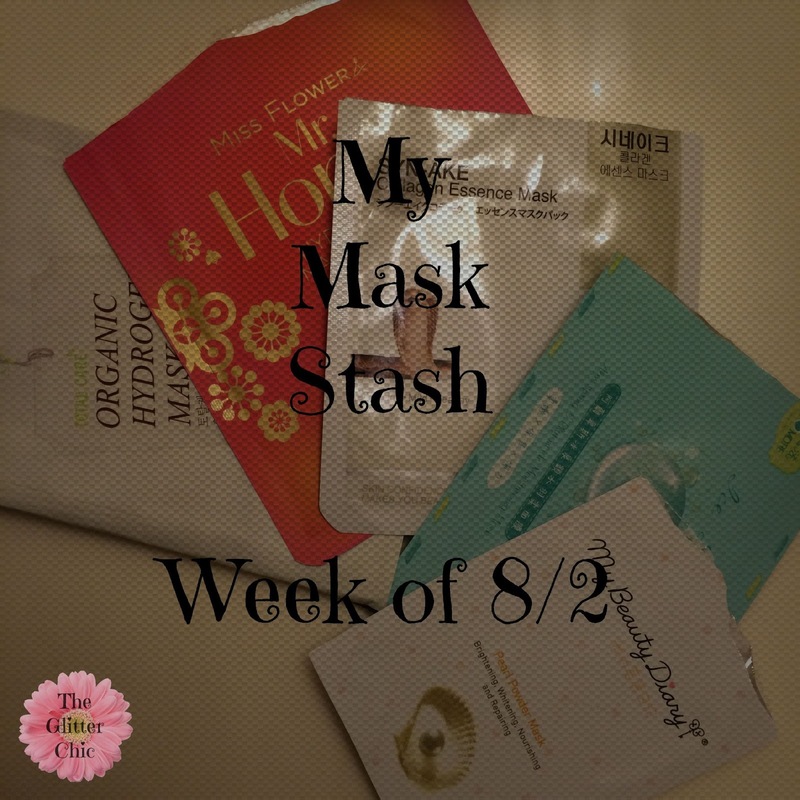 What masks did you use this past week? Disclaimer: The Glitter Chic blog purchased/received the product(s) mentioned in this post for the purpose of review and evaluation. No monetary compensation was received for this post. 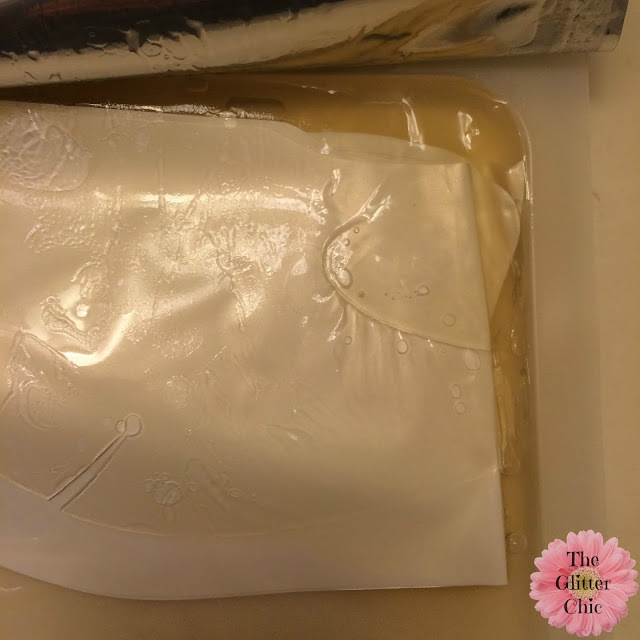 The Glitter Chic blog will always provide honest opinions, beliefs or experiences on products reviewed. If you have any questions, please contact me at gothickornchic at gmail dot com. This blog contains affiliate links and I may receive a small commission if you make a purchase using one of those links. The Glitter Chic is not responsible for prize delivery. The disclosure is done in accordance with the Federal Trade Commission 10 CFR, Part 255 Guides Concerning the use of Endorsements and Testimonials in Advertising. I don't mind a faint scent at all. Even better though that it fades shortly after applying. I'd try the mask!